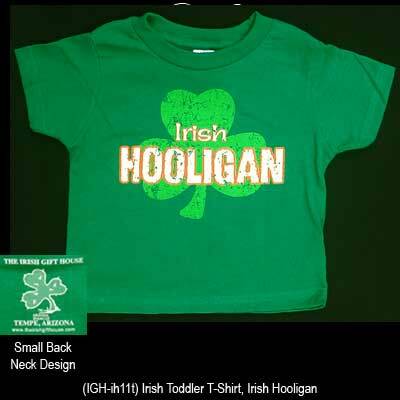 The Irish Hooligan t-shirt features a distressed shamrock and is available in both baby and toddler sizes. This Irish t-shirt for baby is an exclusive product of The Irish Gift House. This baby size Irish t-shirt features the Irish Hooligan motif that is enhanced with a large shamrock. The 100% cotton t-shirt for children has a distressed design with orange and white accenting on a Kelly green color shirt. The toddler size Irish shirt features Rabbit Skins brand quality that is enhanced with a rib necked crew along with double-needle hem, sleeves and bottom and shoulder-to-shoulder taping. The Irish t-shirt is enhanced with a bonus design on the back below the collar, the shamrock/cactus Shamcus logo of The Irish Gift House. This Irish t-shirt is also available in adult and child sizes. The Irish Hooligan t-shirt features a large distressed shamrock and is available in both adult and child sizes.